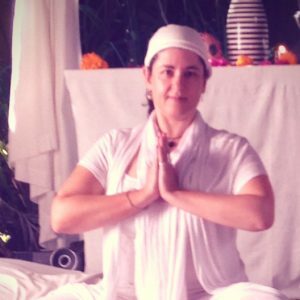 My love of Kundalini Yoga (as taught by Yogi Bhajan) started about 20 years ago with a VHS (showing my age lol) video series by Navair Singh Khulsa. I loved the simplicity of this style of yoga, and the fact that the classes were a lovely lazy way to start the day, usually in my pyjamas, was what drew me to the practice. I’ve always been more inclined towards the slow and easy when it comes to exercise – rather than one to sweat it out with cardio workouts lol. About 10 years ago a deepening of my Meditation practice began – with a sign up to a Deepak Chopra 21 Day Challenge – and I started to realise that working with the mind, on a daily basis, was complimentary to working with the body with yoga stretches – to bring me more contentment in life. 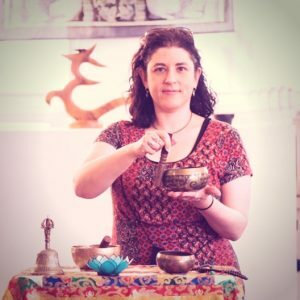 About 5 years ago I decided it was time to start sharing what I was learning and benefiting from, so I focused my efforts, began working with Peter Radcliffe of Skillful MIND retreats and events, became a certified Meditation Leader, helped create a Meditation Leaders Program, and completed my Level 1 Kundalini Yoga Teacher Training with Balwant of Rarest Gem. My journey has been unexpected, sometimes challenging, has taken dedication and determination but has brought me more contentment in life than I could imagine. I’m proud to say I’ve now been sharing my love of Meditation and Mindfulness classes since early 2015, and sharing the joy and technology of Kundalini Yoga classes since late 2016. It’s been a true blessing seeing the benefits radiate to attendees. Please don’t hesitate to get in touch should you have any questions, or want to say hi. Simply send me an email to: hello@mardimay.com.au , or request to join my private facebook group to connect with me and other attendees from my classes.